That has changed dramatically over the past 14 months. U.S. President Donald Trump's crackdown on illegal immigration and his move to strip Haitians, Salvadorans and others of their temporary legal status have had a broad effect on Canada’s refugee system, Reuters interviews with social service providers, government officials and a review of Canadian immigration data show. This unexpected northward migration has overwhelmed Canada's system for processing asylum claims, leading to the worst delays in years. Aid agencies are also struggling to house asylum-seekers because of a shortage of accommodation in the four cities most affected by the migration wave - Toronto, Montreal, Winnipeg and Vancouver. While some of this has been reported, this story offers the most complete picture to date of the unintended effect of Trump's immigration policies on the United States' northern neighbor. Prime Minister Justin Trudeau's government has discussed the situation with the Trump administration, but it has been careful not to publicly blame the U.S. president's policies for triggering the migration wave. Nevertheless, it is already making preparations for more people to cross the border once the weather warms. Since January 2017 Reuters has sought to obtain the numbers of asylum seekers who walked across the U.S. border into Canada in the years prior to Trump's election. The Canadian government has said no national historical data is available. Trump's tougher immigration policies have had a major impact on Canada’s Immigration and Refugee Board, which determines refugee claims. It has become so overwhelmed with cases it is ignoring legislated time limits for dealing with them. 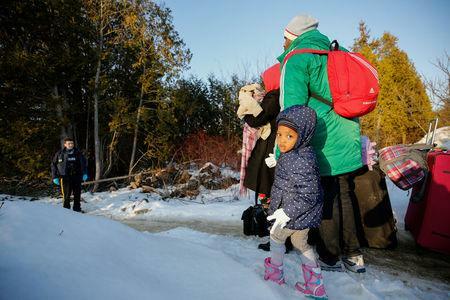 The government is “committed to an efficient and fair asylum system," said a spokesman for Immigration, Refugees and Citizenship Canada, the government department responsible for the Immigration and Refugee Board. Rulings reviewed by Reuters indicate the tribunals are giving credence to claimants who say they feared deportation or racist attacks following Trump's election on a platform advocating more restrictions on immigration. Toronto’s mayor “has raised this issue repeatedly with the federal government,” the mayor's spokesman, Don Peat, wrote in an email. Of 17 organizations Reuters spoke with, 11 said interviews with border crossers confirmed that many were fleeing because of Trump's immigration policies. “We’re struggling, I have to be honest with you." “There is an expectation the numbers will go up ... as the weather gets better,” said a source familiar with the Canadian government's thinking. “And who knows what the next order coming from down south will be?"